In the early 1990s, a private group of New Mexican space activists formed the Southwest Regional Space Task Force, with the intent of creating the Southwest Regional Spaceport, in association with the New Mexico Office for Space Commercialization. Studies, initially funded with $950,000 for “a reusable space capsule landing site“ by NASA, led the task force to focus their efforts on 27 square miles of state-owned land near the small town of Upham, located 45 miles north of Las Cruces, and 30 miles east of Truth or Consequences, near the perimeter of the White Sands Missile Range. The purpose of the spaceport was to be a land recovery facility for commercial and government orbital re-entry capsules, and later even flirted, in the mid-1990s, with the notion of launch-to-orbit facilities and operations, intended to support the NASA/Lockheed X-33 “VentureStar” single-stage-to-orbit program. In 2003, the governor of New Mexico, Bill Richardson, and the New Mexico state legislature were finally sold on the idea of developing the site as America's first inland commercial spaceport. The following year, the X Prize Foundation determined that the state would become the host for the “X Prize Cup” annual spaceflight exhibition and, on December 13th, 2005, it was announced that Virgin Galactic would undertake a joint venture with New Mexico to construct a $225 million facility at the Southwest Regional Spaceport. As part of the agreement between New Mexico and Virgin Galactic, which was signed into law by Governor Richardson on March 1st, 2006, the spaceport was renamed “Spaceport America”. Construction of the launch facility at the spaceport began on April 4th, 2006, but the early operations of the spaceport were dependent on temporary infrastructure, some of which is borrowed from the White Sands Missile Range. With a major investor like Sir Richard Branson of the Virgin Group Ltd, and governmental support behind the project, numerous upstart businesses were looking to use Spaceport America as their literal launch pad to success. Incorporated in 2005, the UP Aerospace Corporation was founded to provide ultra-low cost space access and payload transportation for corporate, military and educational payloads. 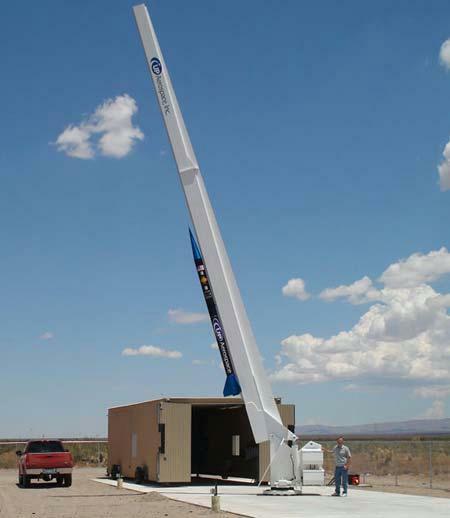 The company, based in Farmington, Connecticut, with offices in Colorado, announced in September of 2005 that they would be the first to launch a rocket from the New Mexico launch facility. The rocket chosen for the inaugural flight was the SpaceLoft XL. Developed by UP Aerospace, the SpaceLoft XL has a diameter of 10 inches, and a length of 20 feet. Propelled by a single-stage solid-fuel motor, designed and constructed in only three months by Canadian-based Cesaroni Technology Inc, provided 8240 pound-force of thrust, making the rocket capable of lifting over a hundred pounds of payload to a sub-orbital trajectory with a projected apogee of 140 miles in only 90 seconds. And with such as historic flight – the first launch for UP Aerospace and the first launch for the New Mexico spaceport – it was the perfect opportunity for something that space launches have become synonymous with... Souvenirs! As the dirt for the spaceport was being turned, the gears in the heads of those at ZeroG Aerospace were turning. Founded in 2004, the team had been involved with advanced rocket development and NASA projects for years - from designing and flying advanced high-impulse sounding rockets to formulating advanced composite fuels for solid fuel boosters – and looking for a way to bring the high frontier of space down to Earth for the everyday person. With UP Aerospace's SpaceLoft XL rocket, ZeroG would be able to design a capsule to carry souvenirs. Dubbed the ZGS-1, the company allowed the public to pay to have personal items carried aboard the rocket to be flown in space, and then returned to them. ZeroG sold the service with the intent that items such as business cards, small boxes filled with keepsakes, or even the cremated ashes of the dearly departed – with prices starting at $49 for a business card, and rising upwards to $1000 for a 25 gram box – were ideal to be flown. The ZGS-1 also made provisions for primary school science experiments. Originally, seven experiments from various schools were selected for the flight, but by the time of the SL-1's launch, ZeroG changes its corporate name to ZG Aerospace, and 50 such scientific experiments were stowed aboard. Also new all-electronic ignition system device for the suborbital rocket was used, developed by Alliant Tech Systems' Tactical division in Rocket Center, West Virginia. A final test of this system as part of the rocket's ignition system was conducted at Spaceport America on September 7, 2006. 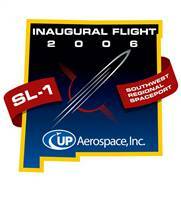 After a series of delays, the first launch of the SpaceLoft XL, given the mission name of SL-1, was set for the morning of September 25, 2006. Before dawn on the morning of the 25th, at 4:30, the launch crew arrived for the final preparations to ready the rocket for launch, intending to fire the rocket at 7:30 AM. But, at 6:15, the launch director indicated there were issues with the primary C-band transponder, and it would need to be replaced. After five hours, at 11:15 AM, the launch director determined the vehicle was ready to fly, and the launch window would be set for 2 PM that day. Slightly behind schedule, at 2:14 in the afternoon, the countdown was reduced to mere seconds, and the moment had arrived. New Mexico Economic Development Department Secretary Rick Homans pressed the launch button, the solid rocket motor ignited, and SpaceLoft XL was sky bound - piercing the clear blues skies with a thin, straight white ribbon of ammonium perchlorate exhaust. But, thirteen seconds into the rocket's ascent, at 24,000 feet, the smoke trails corkscrewed to the right and vanished. Being tracked by radars at the White Sands Missile Range, the rocket continued upwards to 42,000 feet, hung in the air for a moment, and began the long plummet back to earth – where it impacted several miles from the launch site. To the viewers from the ground, it was fairly apparent that something was amiss. Their suspicions were confirmed when the mission director addressed those assembled: "Because of an unexpected aerodynamic effect, the vehicle was short of its effected range." “We had a perfect launch as far as the spaceport goes, so that’s a complete validation for us,” said Dr. Patricia Hynes, director of New Mexico’s Space Grant Consortium. But the SL-1 mission team was less than thrilled at the loss of their vehicle. The rocket was lost, and possibly wrecked, in the vast scrub of the Chihuahuan desert. Aerial crews, as well as searchers on the ground, were dispatched to hunt for the rocket's crash site, which was estimated to be about six miles east of the spaceport. On Saturday, September 30th, 2006, officials from UP Aerospace made the happy announcement – the wreck of SL-1 had been found. Knight credited radar data from the nearby White Sands Missile Range, the intended landing site of the SpaceLoft XL, in helping searchers find what was left of the rocket. "Hats off to the fine radar data provided by White Sands Missile Range and the non-stop efforts of our recovery teams and those of Spaceport America. The partnership and coordination of all of the entities involved is nothing short of superb." The C-band transponder that the rocket was equipped with, tracked the return trajectory to 2,000 ft above the desert. What is generally concealed from the public, however, was that the SL-1 was demolished when it struck ground. Much of the payload, including the ZGS-1 capsule, was blackened and twisted beyond recognition, or outright destroyed from the impact. The rocket's flight data recorder, originally about nine and three-quarter inches in diameter and 11 inches tall, was compressed down to, according to Larry Alvarez, a systems technologist for the Space and Telemetry Center at the New Mexico State University, "about two or three inches tall. It was like a squashed Coca-Cola can." Once the wreckage was recovered, UP Aerospace began to investigation the loss of control of the rocket. During the intensive two months that followed, that necessitated to postponement of next SpaceLoft XL flight during the Wirefly X Prize Cup competitions slated for October 21, the company learned of a shortcoming in their rocket's design – it did not spin fast enough on its ascent, in concert with having too low a margin in terms of aerodynamic stability. "We thought we had plenty of margin," according to Jerry Larson, President of UP Aerospace, but the investigation into the rocket's flight showed a far less stable vehicle than had been predicted pre-launch. "There were no fins that fell off. The vehicle actually remained structurally intact throughout the entire flight...down to the ground," Larson said. The rocket's inadequate spin rate meant that the rocket could not correct for thrust-induced forces expected for a fixed-fin vehicle that is climbing and accelerating. "Essentially, it's all isolated to the fin section of the vehicle," said Larson. So, to compensate for this tendency, the SpaceLoft XL was slightly redesigned to include a redesign of the tail fin section, included the addition of a fourth tail fin, that would increase the rocket's spin rate. Also, the next SpaceLoft mission was to include a data sensor - built by New Mexico State University - to gather information about the corrective actions taken for SpaceLoft XL's return to flight mission. On April 28, 2007, at Spaceport America, the second SpaceLoft XL, designated as the SL-2 mission, was launched. As a part of its payload were portions of the cremated remains of Mercury astronaut Gordon Cooper, Star Trek actor James Doohan – aka “Scotty”, and about 200 other people. The launch was a complete success, although it was nearly three weeks before the rocket, which was recovered intact, was found on May 18, 2007, outside of its projected landing zone. Among the payload of the SpaceLoft XL rocket were these coins as well as mission patches. Because of the crash, the medal itself is somewhat warped and does has some signs of 'distress' to it. ZG Aerospace recovered all the items they could from the ZGS-1 capsule, tagged them, and place them in their space registry with a classification as 'attempted' in the space flight column. ZG did not offer a replacement flight for any of the recovered or destroyed items.